This year is the 30th anniversary of the comedy classic Ghostbusters, first released back in June of 1984, and we've seen all kinds of celebration for the film. The movie has been newly restored for re-release on Blu-ray (with its sequel also updated for its debut in the format); LEGO has made some awesome Ghostbusters-themed sets, and even we here at Cinema Blend have celebrated the legacy with a features of remembrance. Now Krispy Kreme is getting in on the action, and they're doing so in the most delicious-sounding way imaginable. 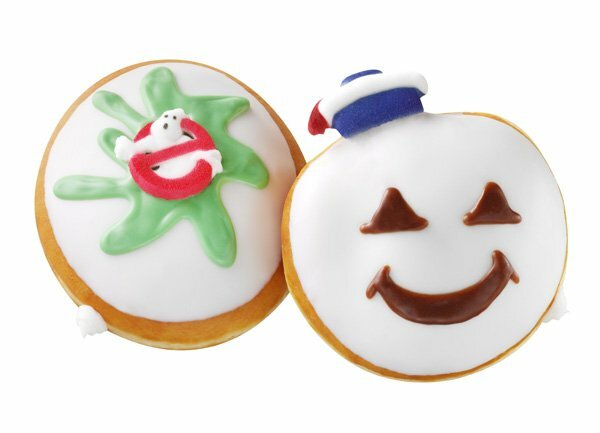 The doughnut company has officially announced a partnership with Sony Pictures Consumer Products that will see the creation of two very special Ghosbusters doughnuts that have been "inspired by the supernatural comedy’s sweetest villains." Set to be timed with the release of the aforementioned Blu-ray release, the tasty treats will be in stores for only a limited time, starting on September 29th and ending on October 31st (and only at participating outlets in the U.S. and Canada). While this is certainly a nice, fun treat for Ghostbusters fans to remember the past, Sony is starting to get very excited about the franchise's future. After years of being stuck in development hell, Ghostbusters 3 now looks like it is actually happening - and possibly with an all-female cast. While it has not yet been confirmed, it has been reported that Bridesmaids director Paul Feig is in negotiations to helm the project, which is expected to start production next year and be in theaters for 2016. The studio is undoubtedly excited to take advantage of all of the nostalgia juice that has been flowing around the series this year, so in the coming weeks and months you should definitely expect to hear a lot more about it. As always, we will have all of the info ready for you as it comes pouring in.